Reading manager Brian McDermott is awaiting Blackpool's response having submitted a formal offer for England Under-21 forward Tom Ince. 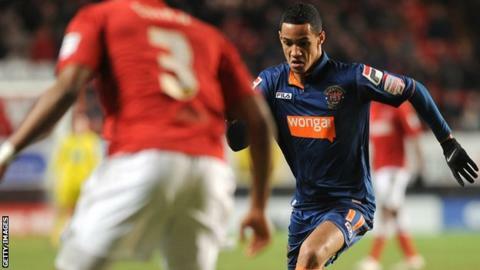 Ince, 20, who has scored 15 goals in 27 appearances for Blackpool this season, is also being monitored by Liverpool. Reading's bid is understood to be just below Blackpool's £8m valuation, while Liverpool do not want to go above £6m. "We are waiting for Blackpool to come back to us, we shall see where it goes," McDermott said. "He is a Blackpool player so it is difficult for me to comment. "But he is a player of real quality. He can play in the number 10 role, on the right and the left. "He has fantastic feet, loves his football, scores goals, creates goals and has got a real hunger about him. "Having said that, he is a Blackpool player so I wouldn't normally talk about a player who doesn't belong to us. "But he deserves a lot of respect for what he has achieved since leaving Liverpool 18 months ago." Ince had been expected to return to Liverpool during the transfer window but a disagreement over his value has brought that deal to a halt. Liverpool are prepared to wait until the summer when Ince's contract expires and his fee would be set by an FA tribunal but Reading's interest may scupper that plan. McDermott is hopeful that the lure of regular first-team football may persuade Ince to move now.